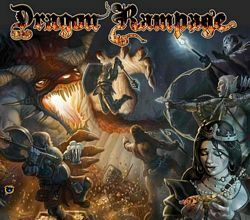 Dragon Rampage is a strategic dice game for 3 to 5 players. Each player takes the role of one of the adventurers (all with different abilities) and the goal is to score the most points at the end of the game by fighting against, or running from (or some combination of the two) the dragon you just woke up, and tallying up the treasure and gold you obtain in the dungeon. Players roll 7 specially designed dice, and can choose whether to focus on grabbing treasure (from the dragon or from another player), fighting the dragon, protecting themselves and their treasure, or running for the exit. Try not to draw the dragon’s attention as you make your way, and note that your fellow adventurers may hinder (or aid) you in your strategy and that the final scoring changes depending on how the game ends, so watch your step!